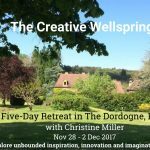 offering exclusive and innovative leadership and creativity retreats and events for groups and individuals. a protected area of notable biodiversity, in the Perigord Noir region of South West France. to birds such as golden orioles, hoopoes and eagles, and many butterflies, frogs and dragonflies. as it changes colour over the seasons, the superb sunsets, and the raptors regularly cruise overhead riding the air currents. complete with bar and restaurant, a beautiful 12th century church, and other historic buildings in typical Perigourdine style. a veritable magical place for relaxation, inspiration and renewal, where time has stood still. Pessel offers beauty, nature, peace, inspiration, local history, an environment of rich experiences and renewal, nourishment for body, mind and spirit. This is a place where you can explore your deepest desires and grandest visions in safety, and develop into real-world projects. then no other rule is required for the creative blossoming of good hearted, big-hearted, conscious lives and conscious business.